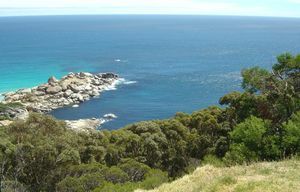 The dive site Logies Bay is a shoreline rocky reef in the Llandudno area on the Atlantic seaboard of the Cape Peninsula, near Cape Town in the Western Cape province of South Africa. The location is the bay to the right of Llandudno beach. It is easy to see from the car park above the turnoff to Llandudno when coming from Camps Bay. The difference between this bay and the main Llandudno bay is remarkable: whereas the main bay is a beach with the sand extending into deep water, the Logies Bay is full of kelp and rough boulders with no sand in sight. Furthermore, whereas Llandudno has a popular surfing wave, the small rocky headland tends to protect this bay and it is rare to see much of a swell come in. The rock formations along the north shore are quite interesting in places as there are many small caverns and holes. This sort of formation extends below the water and this makes the diving interesting: the small holes are good places for marine life to settle and while not extensively covered the life on the rocks can be very beautiful. The rocky sections do not extend far beyond the shoreline and the bottom soon becomes sandy interspersed smaller boulders covered with kelp. The kelp is seldom dense enough to be a problem. The site is exposed to swells from the west, and is often good during or after south easterly winds. The site is reasonably protected from south westerly swell due to the little headland, but if the swell is large or long period it will get into the bay. The site is usually at it's best in summer but there may also be occasional opportunities in spring and autumn. This is an area which sometimes has upwellings, caused by south easterly winds, resulting in cold clear water which may be followed by a plankton bloom. The site is normally accessed from a shore entry. Drive down the road to the beach parking lot. This is a summer site and there may be a severe shortage of parking on hot sunny days and particularly weekends. The little parking lot overlooks the beach, but you should notice a red dirt road leading to the right which is not accessible by car. Kit up as much as possible here and walk along this road until you reach the small bay. Getting to the water’s edge includes a short scramble down a steep slope and some boulder hopping. A small point of flattish smooth rocks extends slightly into the bay and this provides a useful entry site. An interesting phenomenon which can be observed here is the congregation of Box Jellyfish in columns. The jellyfish, which usually swim in an apparently random pattern, congregate and form a column a few metres wide at most, from the bottom to the surface over the bright sand. The jellyfish can be seen actively swimming towards these columns which are packed with the animals. These columns are more likely to be seen on the larger sandy areas. This page was last edited on 17 November 2010, at 08:41.